Getting it's name as gaeilge Focherd, meaning the good cast, from a feat that Cuchulainn performed during the Tain, where the legendary hero slew a number of his foes with one throw of his spear. It is also the birthplace of one of Ireland's three patron saints, Brigid. A well carrying her name is in the graveyard on the summit, as well as a medieval church (12th century), St Brigid's Pillar and St Brigid's Bed. The final resting place of Ireland's Last High King, Edward the Bruce (or most of him anyway). He had passed over the hill for the first time on the 29th June 1315 on his way to sacking Dundalk. He was killed here in battle on the 13th October 1318, he was beheaded on the stone of decapitation and his head sent back to the King of England. Standing at the southern end of the Gap of the North/Moyry Pass one of the five ancient roads to Tara runs past here and Faughart held huge strategic importance for many centuries and was the scene of much bloodshed in many battles. 8th century King Aedh Roin was beheaded here on the stone of decapitation. In 1593 Hugh O Neill & Hugh O Donnell (the two most powerful men in Ireland at the time) meet with Earl of Ormond at the hill. This meeting leads to the start of the nine years war, which in turn ultimately leads to the flight of the Earls and the plantation of Ulster! Lord Mountjoy taking control of this pass in 1600 greatly affected O'Neill during the war. King Billy passed over the hill on the 27th June 1690 on his way to the Boyne. The first body of one of the disappeared was returned at this hill, that of Eamonn Molloy on 25th May 1999. 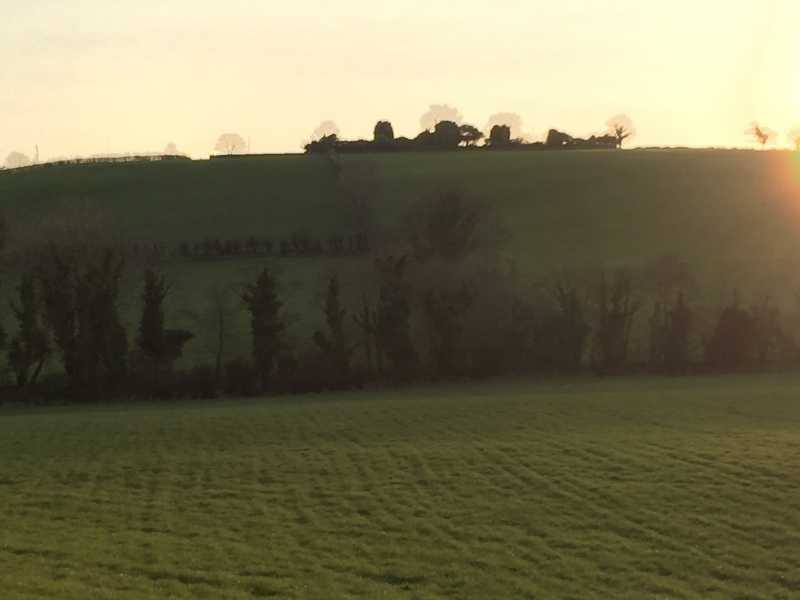 At the summit of the hill is the top of a large Norman Motte and Bailey, which was built over a much earlier earthworks Hill of Faughart is the 1492th highest place in Ireland. The Hill of Faughart is a geographically subdued eminence visible but not conspicuous from the dual carriageway just north of Dundalk, but it is well worth the short diversion on the drive north or south, blessed as it is by excellent views of upland, lowland and sea. Of even greater interest is its part in Irish history throughout the ages, a role excellently recounted in Trailtrekker's outstanding summit comment.